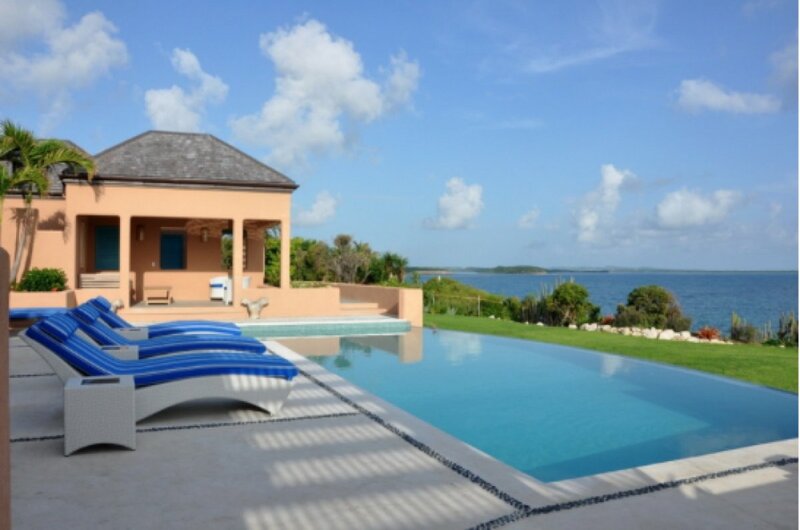 Couples and families who want a totally private vacation on Antigua’s east coast will love this villa rental. Long Bay #004 is spacious and open, which allows the ocean view and breeze to fill the villa. The home has a full kitchen, interior and exterior dining areas, and a comfortable living area. This villa’s privacy comes from 1.5 landscaped acres filled with tropical plants, and a small garden is all that stands between the villa and the sea. Long Beach is a short drive away, and you can snorkel and sunbathe to your heart’s content on a white sand bay. Long Bay #004 is set over the sea, surrounded by tropical gardens. Any guest will love the nonstop ocean view and island breezes that drift through the villa. With a huge kitchen and cozy den, this villa is the perfect family vacation rental. Step into the infinity-edge pool and take in the ocean view, or relax into a lounger and soak up the sun. Take a break from reality and stretch out on the chaise lounge with a good book, as island breezes float through the villa. The villa’s open-concept design eliminates barriers between guests and the sea, with ocean views from nearly every room and windows everywhere. The living room’s tropical decor and the kitchen’s impressive size guarantee a dreamy getaway, and the walled garden’s al fresco dining allows guests to feast in the sunshine. A den off the living room leads into a king bedroom with terrace access and an ensuite bathroom. On the other side of the villa, two more bedrooms with ensuite bathrooms open to private terraces. One bedroom has two twin beds that can be converted into a king. Guests can vacation in privacy with lots of common space between the two sleeping areas. Long Bay #004 is at the edge of the island on a quiet peninsula. This vacation home is perfect for guests who value privacy above convenience, and want to see as much of the ocean as possible. Long Bay beach is a 5-minute drive from the villa.